I LOVE BACK TO SCHOOL TIME– okay, so the secret is out; but I’ve always loved going back to school. Even when I was growing up, I would start planning my back to school outfits weeks in advance, start saving my allowance for school supplies, and I loved flipping through flyers and spotting the deals. I still get excited walking into Staples and checking out the pens, binders, and all the dodads. 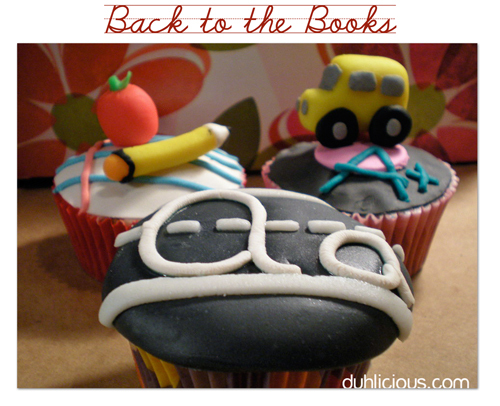 So even if you don’t share my enthusiasm for heading back to class, I’m sure you won’t mind back to school cupcakes. These were made using my classic vanilla cupcake recipe listed here, with store bought fondant. All the details were made using my new favorite tool– a clay gun. you are awesome! I keep comming back to your site and everytime i come I find more genial stuff and ideas of yours!you are so creative!I could really sense a huge talent in you.I wonder how long it takes until somebody with lot of influence will spot you and give you the chance to nourish! Too doggone cute! Love them! Adorable!! Especially the big A and the small a. Ahh, those handwriting lessons! I remember those well!